Kod*lab engages in a variety of education and outreach activities, both individually and through the GRASP lab. Mentorship – One of our primary modes of outreach is mentorship. We welcome undergraduate participation in research as well. Please contact us at kodadmin@seas.upenn.edu for further information if you’re interested in getting involved! Learn how to design, build, and program dynamical, legged robots that can operate in the real world. How do robots climb stairs, traverse shifting sand and navigate through hilly and rocky terrain? This course, part of the Robotics MicroMasters program, will teach you how to think about complex mobility challenges that arise when robots are deployed in unstructured human and natural environments. The USA Science & Engineering Festival in Washington DC is held every two years. Over 265,000 people of all ages attended the event regarded as the largest STEM event in the country. We participated in 2016 and 2018 and will again in the future! 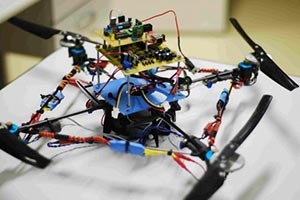 TOBI (Teacher Oriented Bio-Inspired) Robot is a four legged robot intended to help students more easily understand the connection of the robot to familiar animals such as dogs and cats. TOBI can be programmed through Physical Programming, a method that allows a user to record static leg positions and strings them together in the final gait. Upcoming generations will enable both Physical Programming and more traditional programming for advanced users using an Arduino microcontroller. On Saturday, October 11, 2014, nine high school students from The Franklin Institute’s (TFI) Partnerships for Achieving Careers in Technology and Science (PACTS) program participated in Kodlab’s art and robotics workshop, “TOBI in the House”. Students collaborated in groups of 3 to produce a video art piece with TOBI (teaching oriented biologically inspired) Robot, a four-legged robot, by developing a narrative, creating a set design and physically programming the robot’s performance. This was one of the videos from the workshop. The workshop was also held with students at PAFA, Central High School students at Slought Foundation and KBIHS students at the Department of Making and Doing. 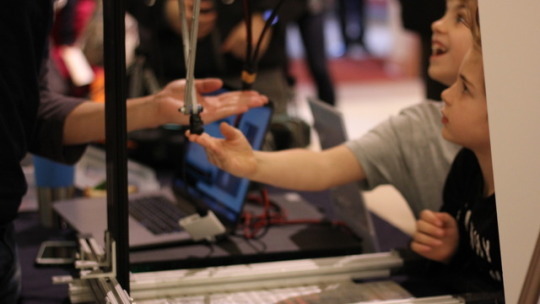 PRX is a one-day robotics event open to students from around the city of Philadelphia. Every year Kod*lab participates. In 2017, Paul Reverdy and a team of Kod*lab students provided demos and an exhibition table for middle school students for PRX at the Nano Center, Penn Engineering on May 30, 2017. A poster about Kod*lab’s work on desert research was part of the display. Robot Revolution is a groundbreaking exhibition, that debuts in Philadelphia at The Franklin Institute this Saturday, October 8, 2016. See a collection of 40 cutting-edge robots from around the world, including RHex and RiSE. There are lots of interactive, hands on activities to engage with the robots. One can even operate RHex! Visit a post from November 2015 to learn about Anna Brill, a Kod*lab undergraduate researcher, who was a Robot Technician for the same exhibit in Chicago and Denver. In conjunction with the Robot Revolution exhibition at The Franklin Institute (TFI), in which Kod*lab’s RHex robot was displayed, TFI hosted a series of Saturday event programs, one of which was Robot Zoo. Kod*lab produced a poster to describe the RHex and the desert research, and provided interactive demos of Minitaur for the Robot Zoo on Saturday, March 11th. On Sunday, April 23, 2017, the Pennovation Center and PERCH hosted Philadelphia Science Festival Event called Be A Pennovator! Be A Pennovator! was part of the Be A Scientist For a Day! program of events where adults and children alike could learn what it is like to be a scientist. The University of Pennsylvania is a core collaborator of the Philadelphia Science Festival, a 9 day festival held April 21-29, in partnership with the Franklin Institute. Kod*lab students participated in the all-day event in which was over 200 people come through PERCH and Pennovation to see demos and hear innovation talks. At Be a Pennovator! Sonia Roberts and Diedra Krieger led a workshop titled “Trashbots” that repeated four times throughout the day. Participants made vibrating robots using just 2 rechargeable AAA batteries, a small motor, and scraps. Students learned how to make the motor vibrate and then experimented with different types of legs to learn about locomotion. As part of our outreach efforts to support and encourage youth interested in STEM and robotics, Kod*lab judges FLL Qualifying Tournaments every year.